As previously announced, the legendary Apollo Theater in Harlem, New York City, NY, will host the 2018 Evening of Respect. Whoopi Goldberg will host, and the Dap Kings will serve as the house band backing performances by Otis Redding III and Dexter Redding, Steve Cropper, Jussie Smollett of Empire, Paul Janeway of St. Paul and the Broken Bones, The Preservation Hall Jazz Band, and more to be announced! All of these artists worked with or were influenced by Otis Redding. 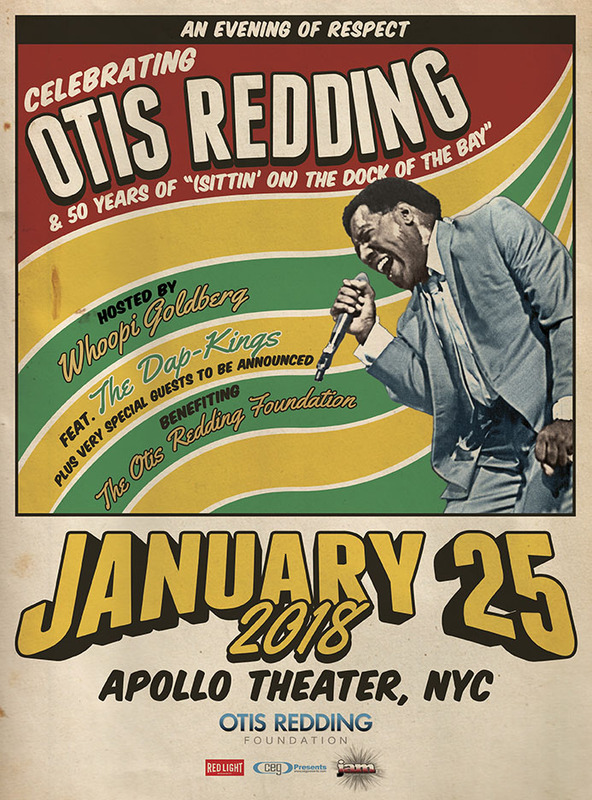 The Evening of Respect will celebrate 50 years of “(Sittin’ On) The Dock of the Bay” and serve as a fundraiser for the Otis Redding Foundation. The Otis Redding Foundation, with its roots in music, has created educational awareness programs in the arts and humanities. These programs encourage individual and team participation, build self-esteem and instill discipline. To honor Otis’ dream, the Otis Redding Foundation provides opportunities for youth to improve their academic performance by helping them make choices in life that enrich rather than endanger. By providing programs that ignite dreams in our future generation of leaders, we remain dedicated to connecting the universal relevance of music to serve as a catalyst for education and other youth oriented initiatives. Mission Statement: The Otis Redding Foundation’s mission is to empower, enrich and motivate youth through education in music. Each partnership and program sponsored since its inception in 2007 supports the philanthropic commitment of Otis Redding to empower and enlighten all young people to fulfill their dreams. Tickets are on sale now for the 2018 Evening of Respect! This WILL sell out. Get yours here.